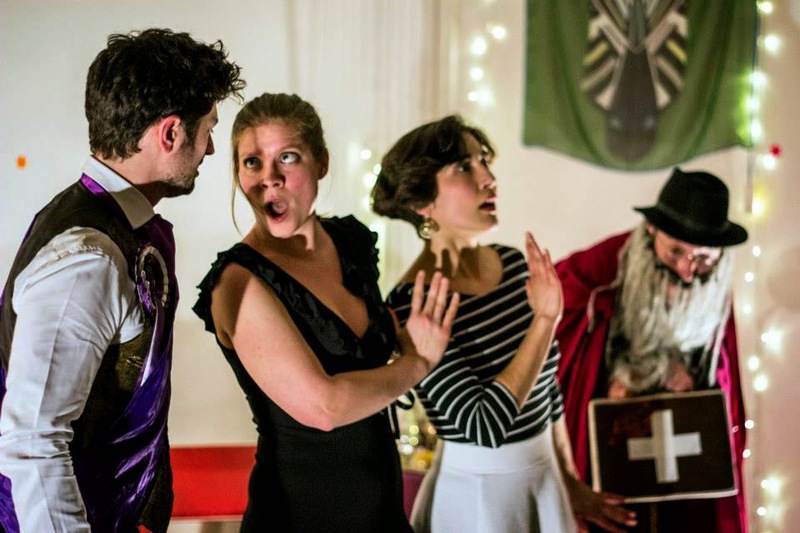 Popup Opera's spring season of operas in unlikely places was a chance to venture to a gallery in Hackney Wick to see this short opera about a young man who goes into various disguises to win the hand of his lover. With some great performances, fresh ideas and a few modern twists, it makes for a fun (if slightly silly) night out. The piece by Bizet is a comic opérette (a French form of light opera), in one act by Bizet for soprano, mezzo, tenor and baritone. The hero, a young man called Silvio, comes to the mayor's house in various disguises in order to win the hand of the mayor's daughter, Laurette. The mayor's new wife conspires with his daughter to see true love prevails, but not before some mild hi-jinks. The young and talented cast on Thursday evening kept things both comical and musical. Christoper Diffey, who previously we had seen in Troy Boy, as the hero Silvio, manages the task of singing and wearing boxer briefs well. Aurélia Jonvaux as Laurette has a beautiful strong voice and an excellent sense of comic timing. Joseph Kennedy and Sarah Champion round out the cast as the Mayor and his new wife, revelling particularly in the silliness of their characters. Popup Opera are on to a winning formula by presenting rarely seen or minor works by great composers with a twist. The twist is both the venues and in the presentation. Much is made of the space of the gallery to enable the cast to run around and interact with the audience. As there is a cooking theme throughout the piece, the evening is presented as a menu of selections. The highlight is the Omelette Quartet, where all the cast sing the praises of an omelette (until they try to eat it). There are some nice topical references as well such as Silvio using "Nigella's special baking powder" while in disguise as a chef. The company is touring throughout the spring at some wonderful locations around England and this piece in particular is worth seeking out. Check their website for details or follow them on Facebook.